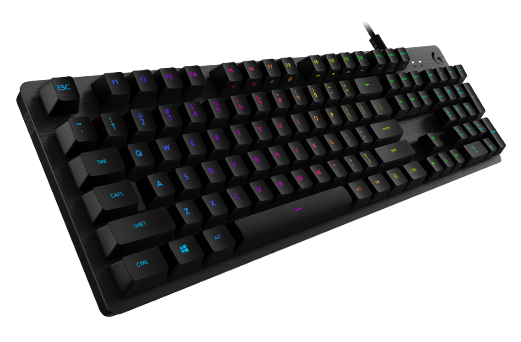 NEWARK, Calif. & LAUSANNE, Switzerland — June 12, 2018 — Logitech G, a brand of Logitech (SIX: LOGN) (NASDAQ: LOGI) dedicated to creating high performance gaming gear, today announced the Logitech G512 Mechanical Gaming Keyboard and a new mechanical gaming switch option, GX Blue. The Logitech G512 is a high-performance mechanical gaming keyboard built on the award-winning design of the G413 and G513. The keyboard offers three different key switch choices – Tactile, Linear and new GX Blue. The introduction of the GX Blue key switch, which will also be available on the Logitech G513 Mechanical Gaming Keyboard, further expands our lineup of mechanical key switches available on our industry leading keyboards. Powered by Logitech G’s exclusive LIGHTSYNC technology, the Logitech G512 takes RGB lighting to the next level. Light and animation effects can be customized across approximately 16.8 million colors, with four lighting zones using the free Logitech Gaming Software (LGS). The Logitech G512 features an anodized and brushed aircraft-grade 5052 aluminum top case for a slim, premium design with rigid durability. An integrated USB cable connects the USB 2.0 passthrough port to its own input for 100 percent power throughout. The mechanical gaming keyboard is available in Carbon (Black). In addition, Logitech G also announced that it will be providing early access to a new software experience named G Hub. Still in early stages of development, our eventual aim with G Hub is to create a software experience that provides the same functionality and benefits of Logitech Gaming Software, but with a modern, easy-to-use interface and enhanced capabilities. By opening this early access experience to the community, we hope to gather feedback that will help us to make the G Hub experience even better. The Logitech G512 Mechanical Gaming Keyboard with choice of Tactile, Linear or GX Blue key switches is expected to be available on logitech.com and at select retailers in Asia Pacific beginning June 2018 for a suggested retail price of $99.99. The Logitech G513 Mechanical Gaming Keyboard with GX Blue key switches is expected to be available in the United States, Canada and select countries in Europe beginning June 2018 for a suggested retail price of $149.99. The G Hub early access is expected to be available in July 2018. For more information, please visit our website, our blog, or connect with us @LogitechG.